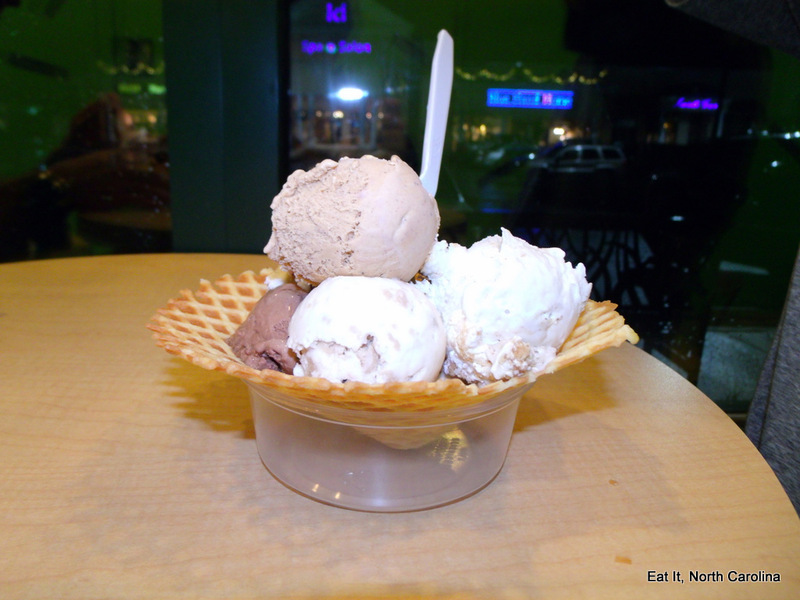 It’s December and I’m writing about ice cream that I ate while I was at the beach. Weird. 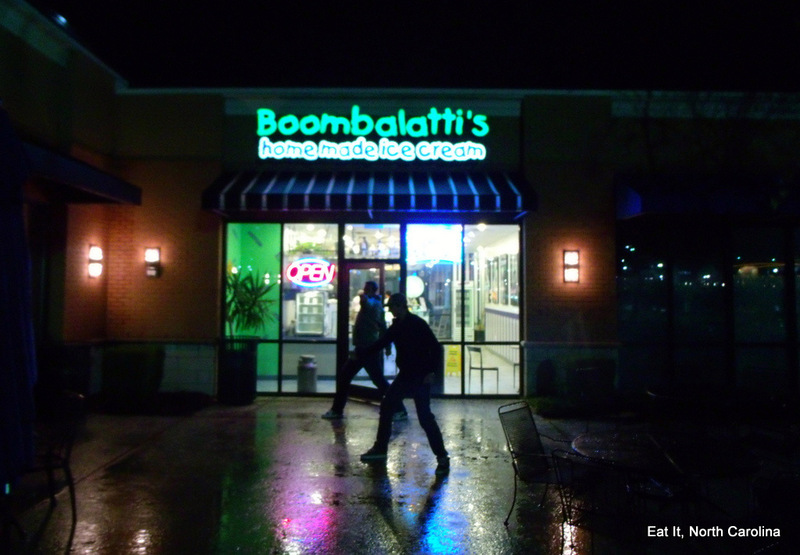 Boombalatti’s is the place in Wilmington where everyone seems to get their ice cream fix. When I first walked in, I really thought that it was a chain store. It was very well branded throughout the store and the format of the space really seemed like it could have been a chain but the owner said this was the only location. I could see this becoming a chain especially if they are able to keep up the quality of ice cream production that they are known for. It is located on Military Cutoff Road in The Forum shopping center which is very close to both Wilmington and Wrightsville Beach. I ordered a double scoop of the English toffee flavor. I am a sucker for Heath bars and Skor bars and about any kind of toffee but the ice cream is what makes this so special. 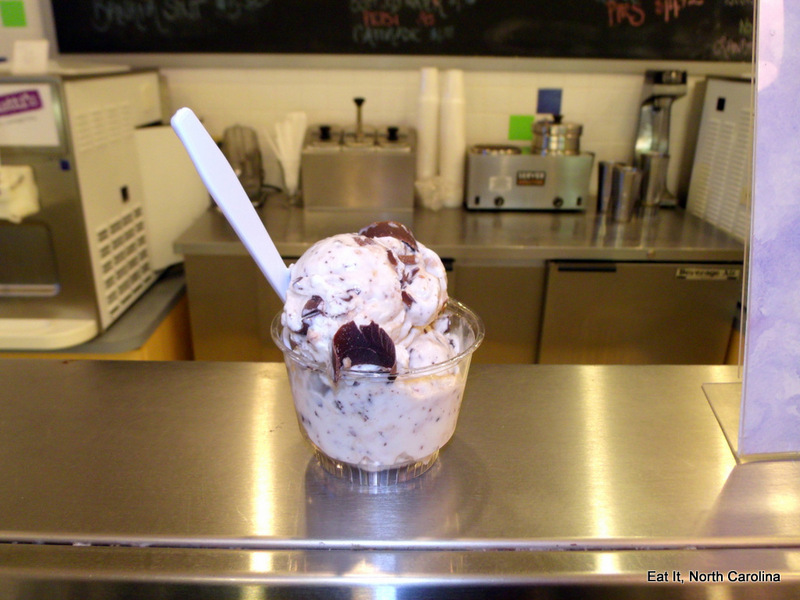 The ice cream is made on-site in small batches using quality ingredients. It is rich and smooth the way that ice cream should be. It seems that most ice creams these days are all into cutting out the calories but doing so causes the ice cream to taste awful. Tyler and Blake both ordered a sampler which came on homemade waffle bowls and had four single scoops of different flavors. This might be the way to go if you can’t pick just one kind of ice cream. I think this cost about $5 or $6 although I had stepped out to the car to grab my camera to snap some shots to post on here so I am not really sure. I can only imagine how this place kills it during the summer beach months when snowbirds descend on Wilmington and Wrightsville Beach to catch some rays and build sandcastles. It isn’t a place that you can walk to from the beach but it is a not-so-far excursion in the car that you will probably turn into a regular thing after your first trip there. 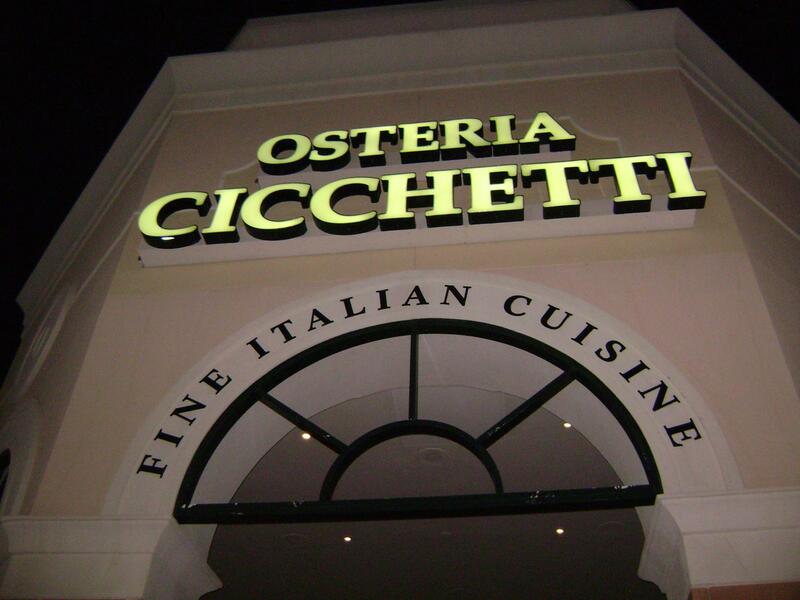 Osteria Cicchetti, known to locals at The O.C., is one of Wilmington’s best known Italian restaurants. The menu isn’t extremely large which is sometimes a good thing because the kitchen can focus on perfecting the smaller amount of items on the menu. They serve a variety of pasta dishes, pizza, salads, antipasti and cold dishes (brushchette, spreads, cicchetti, formaggi & sallumi. The interior of the restaurant looks like a Venice sidewalk at night which is dimly lit by scattered street lamps throughout the dining room. It has that old world Italian feel that gives it a sense of romanticism. I tried to get a few shots of the interior but it was a little too dark for my camera to get anything worthwhile to post. We were in town for an engagement party so I went out with a few of my friends (Will, Jordan, Elliot, Ashley and Dan) to get a nice dinner before the party. 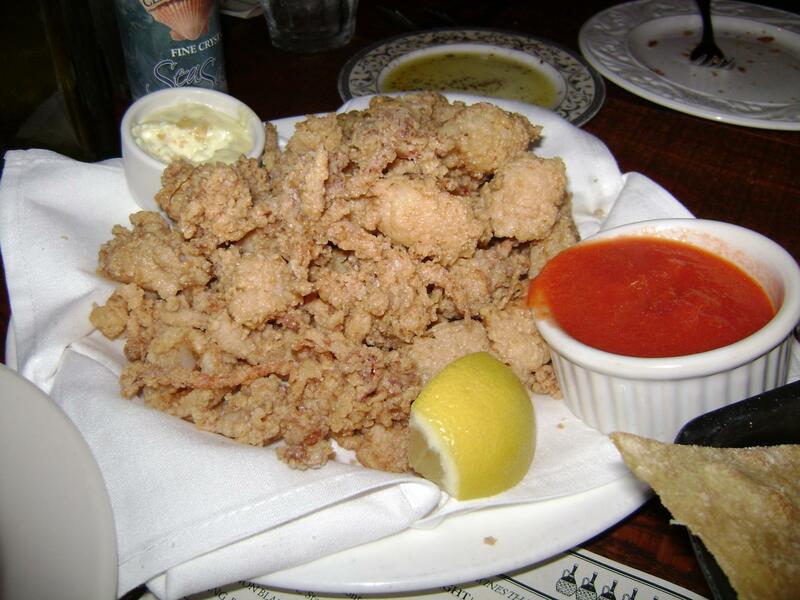 We ordered calimari ($8.75) which came with marinari and pepperocini aioli dipping sauces. It was a great appetizer. The squid was flash-fried and covered in a salty, spicy breading which was only complimented when dipped in the pepperocini aioli. They fried them perfectly so that the exterior was crispy and the interior was tender and not chewy. 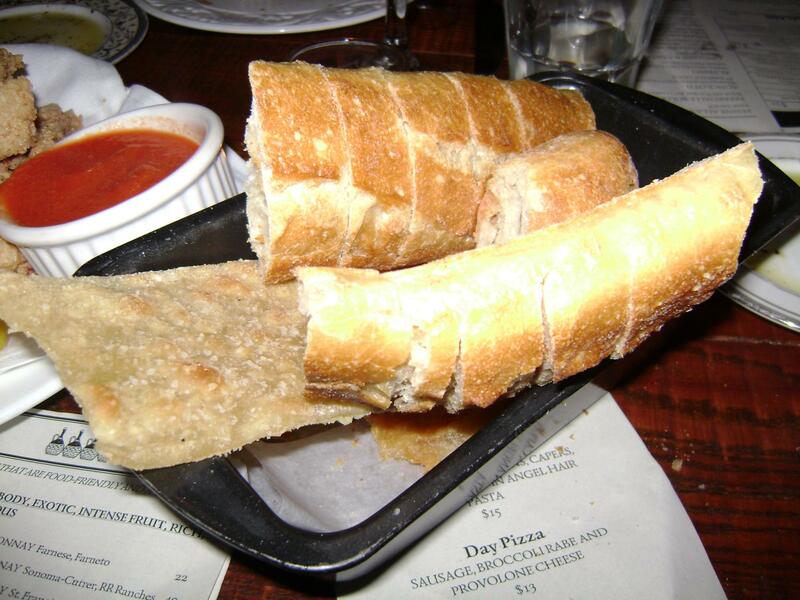 Osteria Cicchetti serves some delectable, complimentary bread up with olive oil and spices for dipping. They served two different types of bread: one was a pane carasau (flat bread) and the other was a hardened Italian loaf. I love complimentary bread and would actually go back just for drinks and appetizers so I could get some of this bread again. 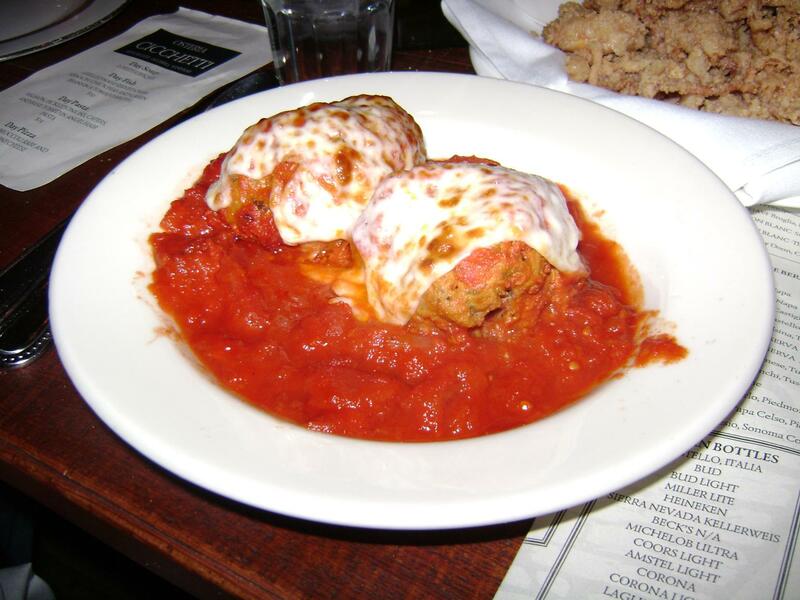 Elliot ordered the Meatballs Napoli ($6.00) which is two baseball sized meatballs covered in melted mozzarella and then served in a bowl full of Napoli sauce which is basically a chunkier version of marinara sauce. I got a few bites of these and would definitely order them again the next time I go. I almost ordered the spaghetti and meatballs for dinner but figured I would try something else since I was planning on reviewing it for the blog. 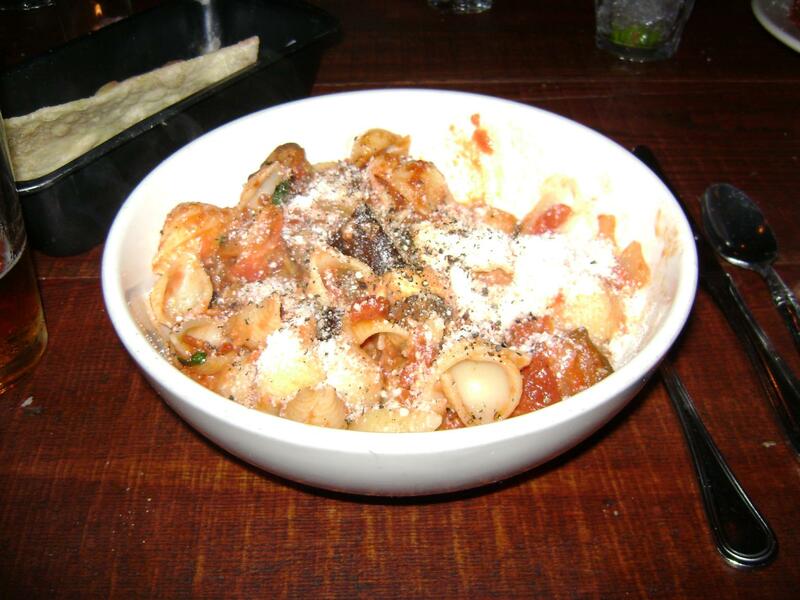 I ordered the Rigate Melanzane which is shell-shaped pasta with eggplant and fontina & mozzarella in a pomodoro sauce. It was good but, in hindsight, I would have gotten something with a little bit more substance (read as: seafood, chicken, steak). It is an good vegetarian selection with a lot of flavor. The portion was massive. My one issue with the dish was that it seemed like it was a little oily but that didn’t stop me from almost finishing it. My apologies for the bad picture. I took a few and none of them turned out very well. I would definitely go back to Osteria Cicchetti the next time that I am craving Italian food when I am down in Wilmington. 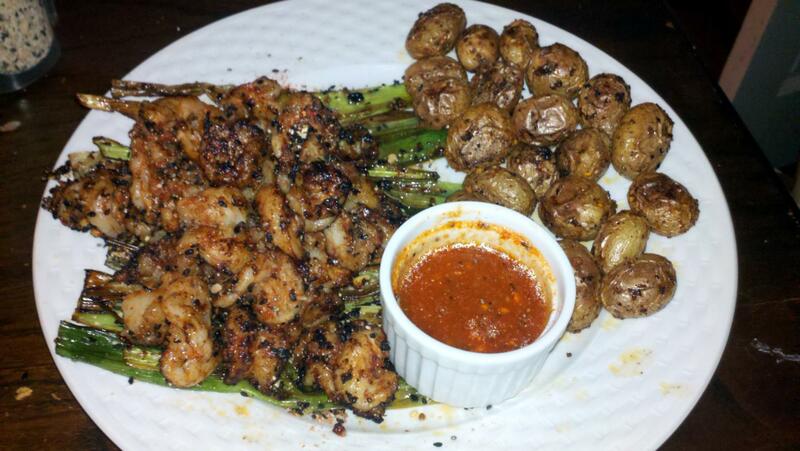 It was a great experience and very reasonable priced for such a nice restaurant. This is definitely a great spot for a family get together or a date. Check it out. I think you will like it. Chef James Bain, the owner of Surf Salt, LLC and president of the Waterman’s Journey Group, has been an influential part of the Wilmington food scene for the past decade previously working in the kitchen at places like the now defunct Harvest Moon and Dockside Restaurant. He has also been prominent in the local surfing scene and the latest beach craze, stand-up paddle boarding. His latest venture, Surf Salt, has been a few years in the making. Surf Salt is “soulful seasoning blends” that are sourced from the world’s best surf breaks. Bain has spent the countless hours researching the world’s most gourmet finishing salts near famous surfing destinations and blending them together with a variety of ingredients to make some tasty combinations. Todos Santos – Smoky and sweet with a little spice for a perfect finish for meat, seafood, and vegetables. Named after breaks along the Pacific coast of the Baja Peninsula in Mexico. Chiba (Gluten Free) – Sour green mango with a kick of sweet sugar cane. Named for the mecca of Japanese surfing off the Chiba prefecture. The Grommet – Crunchy, honey nut. Grommet is a slang term for a young surfer or a young participant in extreme sports. Pe’ ahi (Jaws) – Tropical citrus with a taste of honey. Peahi is the name given to a big wave reef break off of Maui in Hawaii. It is known to us, haoles, as “Jaws” with ferocious waves that can reach up to 120 ft. on the face and is tow-in surfing. Waikiki – Subtle sesame with an ocean fresh flavor. Named after the surfing area where the Duke taught haoles how to surf on the island of Oahu. Kirra – Tangy tomato with grains of paradise. Named after the beachside suburb near Queensland, Australia known for its high quality barrels. Bain sent me some samples of the Kirra, Peahi, Todos Santos and Chiba Surf Salt blends. I wanted to make sure that I cooked Surf Salt with some seafood because that is what I think of when I think of surfing…well that and Turtle from North Shore (“He so haole he don’t even know he haole.”) As you can tell by now, I have never actually been surfing and pretty much have the Hollywood connection to it from watching awesome documentaries like Step Into Liquid and The Endless Summer or classic surf movies like Point Break or Fast Times at Ridgemont High. Even though I have no surfing experience, I have a lot of experience with the ocean as an avid scuba diver. I stopped by the seafood department at the Harris Teeter up the street from my house to see what they had on special. They were featuring some pretty decent looking eastern North Carolina shrimp so I decided to scoop up a pound of those. They also had leeks and creamer potatoes on special so I decided to make butterflied shrimp on a bed of flash-fried leeks with a side of oven-baked creamer potatoes. I am not someone who normally follows a recipe when in the kitchen. I will occasionally bring out a cookbook for certain advanced techniques or if I am baking anything but I normally just go with what I know in the kitchen. I scrubbed the creamer potatoes under the faucet for a second and then dropped them in a Ziploc bag with enough olive oil to coat them. I massaged the bag to make sure all the potatoes were coated and then dropped in two tablespoons of the Kirra blend and shook the bag. The potatoes all received a nice coating of the Surf Salt and then I laid them on a baking pan and cooked them on 350 degrees for about 15-20 minutes until they had reached the crispness that I wanted (they will look a little wrinkled and crisp to the touch). I halved the leeks and then coated them in olive oil in sprinkled some of the Chiba (Gluten Free) blend on top of them and pan-fried them in a non-stick skillet with some additional olive oil on medium-high heat until there was a noticeable char and crispness to them and then let them cool on paper towels much like bacon. I snagged one off the paper towel and tried it by itself. I think I was most pleased with how the leeks turned out. The Surf Salt added a little extra crunch to the leeks and helped disguise the potent olive oil taste. (Note: I have to go buy some good olive oil. I am a frugal shopper & buy whatever is on sale at the grocery store. Any recommendations that aren’t ridiculously expensive but still good quality?). I peeled the shrimp and butterflied them to allow them to cook a little bit quicker when I dropped them into a preheated pan on high heat. It takes a little more work to butterfly shrimp but I think it is worth it because the finished product comes out better. Butterflied shrimp shrivel quickly making them look like mini-lobster tails which makes me feel like a mini-king when I’m eating them. I coated the butterflied shrimp in a little bit of olive oil and shook some Todos Santos blend on them which gave them a sweet & spicy kick. They also picked up a little char on the outside giving it a nice crunch. You may notice a ramekin of sauce on my plate pictured above. I made a makeshift sweet sauce out of some various things that I had in the kitchen. It wasn’t necessary as the Surf Salt gave everything enough flavor on its own and I ended up putting it to the side and not using it. I feel that I may have gone against Bain’s style of cooking with Surf Salt because it seems that every recipe that I have seen on his website doesn’t tend to add Surf Salt until the last step right before the dish is served where it is sprinkled across the top of the dish. I actually cooked with Surf Salt using it more as a rub. One problem that I ran into while cooking with the Surf Salt instead of using it as seasoning was that the Surf Salt tended to char pretty quickly and actually let off a little bit more smoke then intended while I was cooking. However, I was pleased with the way that all three of these dishes turned out even more so after finding out that it wasn’t the preferred method of using Surf Salt. I am planning on trying out a few different styles of food in the way that Bain intended as post-cooking seasoning like in the Todo Santos grilled chicken he made in the video above. I will share them with you as I make them and hope to include some recipes that I find to be good. I hope that my pictures will turn out better than these. 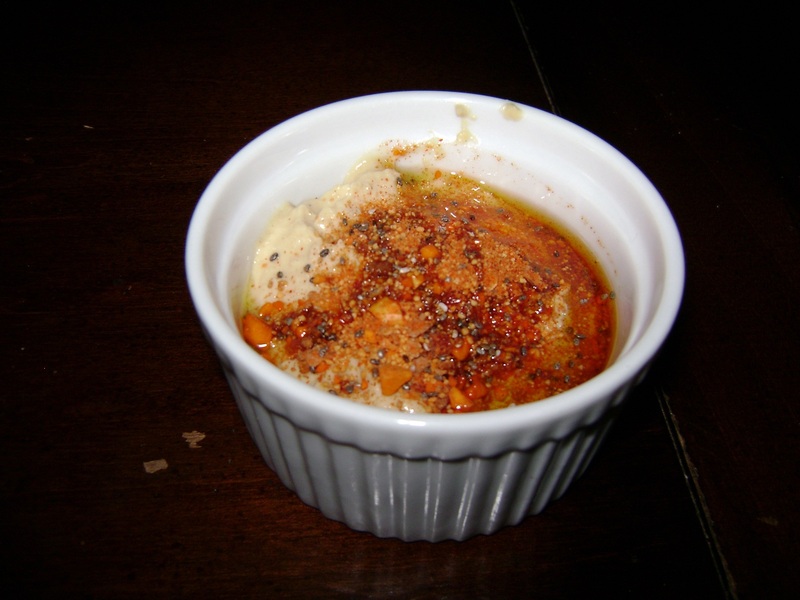 Surf Salt’s website also recommended adding a heaping spoonful of one of their blends to some store bought hummus to give it a different flavor profile outside of the plain ground chickpeas. I added some of the Todos Santos blend because the packaging said that it would provide a taste of smoke with a little bit of spice. I also added a bit of olive oil into the carafe with the hummus and surf salt to add a little bit of richness and help liquify the Sea Salt a little bit. If you get your hands on some Surf Salt, I recommend doing this because it could be a great, inexpensive party snack boasting plenty of flavor especially if you use a variety of the Surf Salt blends and some generic bulk or homemade hummus. 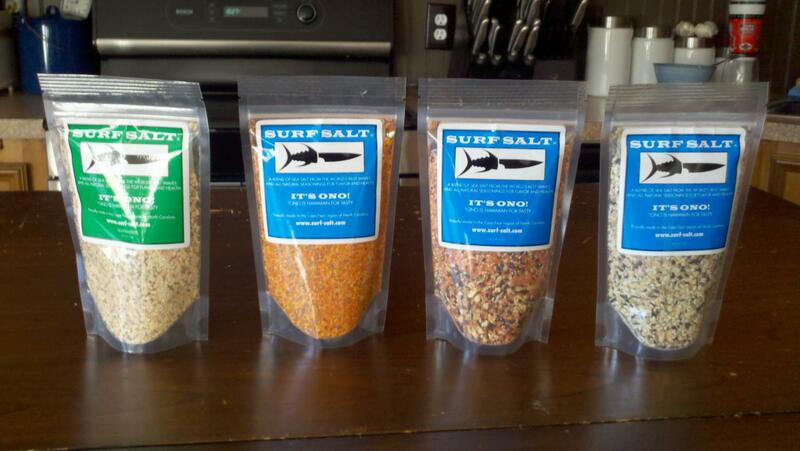 Surf Salt is just one more North Carolina-based product that is very exciting to see going out on the market. Right now, Laird Hamilton, one of the most famous big-wave surfers in the world and co-founder of the tow-in surfing style, is featuring three blends of Surf Salt for sale on his website. Surf Salt has also been very well received at various expos and trade shows in both the surfing and food industries. Check out this blog post on Distressed Mullet about their experience at Bain’s trade booth at the Surf Expo in Orlando back in January. He has some delicious looking cracker and hummus appetizers topped with Surf Salt on there that were the talk of the expo. If you are looking for the answer to adding taste to a meal without adding a lot of unhealthy ingredients, Surf Salt is the way to go. Check out Bain’s website and order a few of their blends. Each package comes in five ounce tamper/spoil proof bags for $8 each. I would suggest picking up a few different seasonings and giving them all a try. Surf Salt is another North Carolina product to add to your kitchen’s arsenal. Expect chefs around the country to be using this soon. 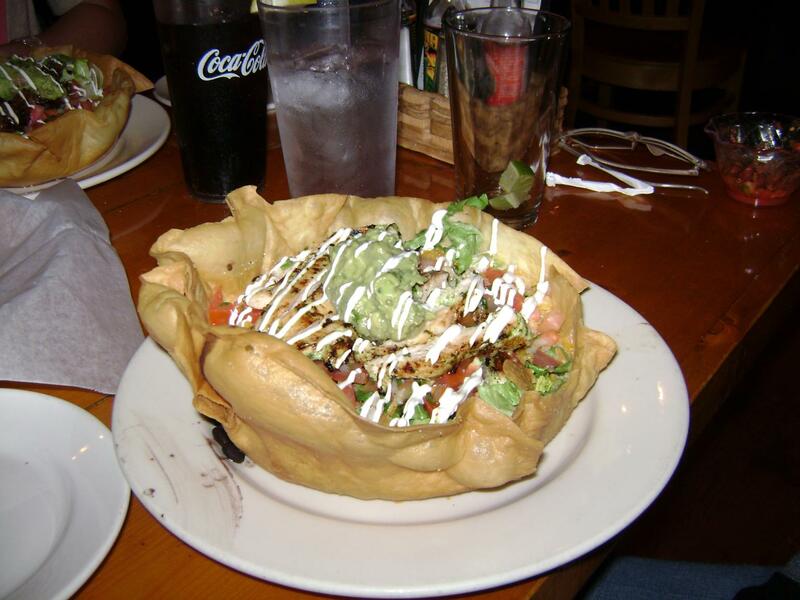 K38 Baja Grill is Tex-Mex restaurant that has been serving Wilmington baja-fresh style food since 1993. I went to the original K 38 Baja Grill located Oleander Drive. I was down there for an engagement party and a bunch of people going to the party met up there beforehand. This gave me the opportunity to get a better feel for the menu because most people at the table ordered something different. The name K38 comes from a kilometer marker in north of Ensenada, Mexico near one of the most famous surf breaks in Baja Mexico. The owners, who’s motto is “Live. Eat. Surf.”, used to go down to kilometer marker 38 and found a taco shack that served some of the freshest baja fish tacos they had ever had. They decided to bring back the same style and atmosphere that they foun Along with K-38 which has two locations in Wilmington (Oleander Dr & Market St), the Live.Eat.Surf. squad also has two other restaurants, Tower 7 and Cafe del Mar, in Wrightsville Beach. K38 Baja Grill’s original location does its best to look like somewhat like the taco shack that they used to frequent down in Mexico. There is a Mexican flag out front, a rusty tin roof awning over the front porch and a string of tacky lights illuminating the front. It is a pretty cool spot and not too close but not too far from all the beach traffic which is perfect if you want to get out of all the hubbub that is on Wrightsville Beach during the summer. 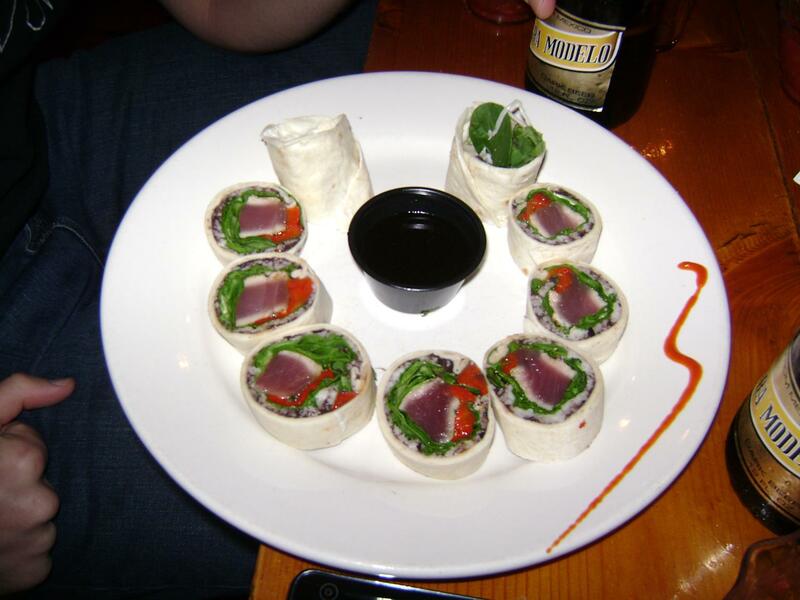 A few people in our group ordered the Santa Fe tuna roll which is char-grilled yellow fin tuna, black bean puree, roasted red pepper, spinach, Monterey Jack and a ginger-wasabi sauce rolled into a flour tortilla. It came with a dipping sauce that was some sort of soy sauce concoction. We joked at the table that it was Mexican sushi but it pretty much is. The presentation was beautiful (as you can see) and the rolls are something that you can order as an appetizer for the table or as a meal for one person. They have a couple different version of the rolls like chicken, fish, shrimp, steak or scallops. Sorry vegetarians…no tofu options on the rolls. Two people ordered the taco salad which is actually called a bowl on the menu. They both went with the traditional which is leaf lettuce, black beans, mixed cheese, salsa fresca, guacomole, sour cream, green onions, & house picante with the choice of steak, chicken or ground beef. I didn’t try this one but both people said it was great. The ingredients all looked extremely fresh and the chicken looked fantastic. The bowls range from $8.95 (vegetarian) to $12.50 (carne asada) which seems like a great deal because of the amount of food that you get in the bowl. 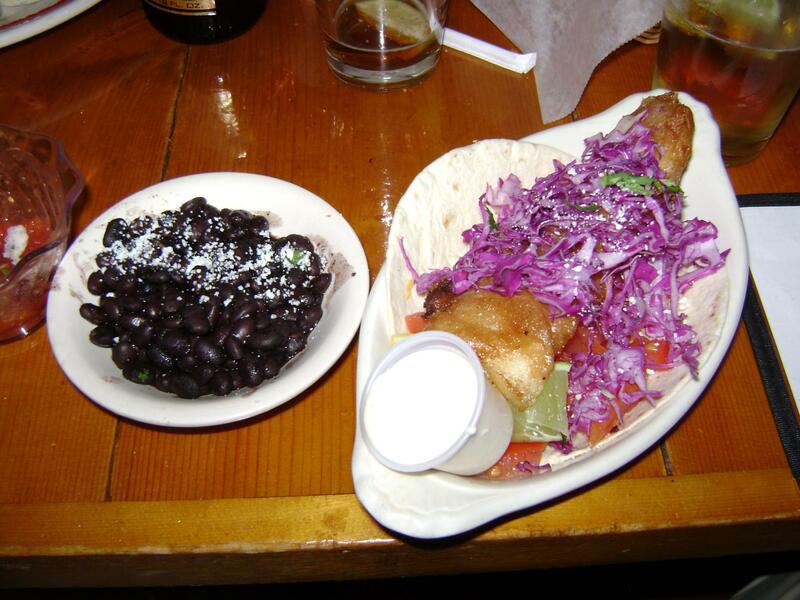 I ordered a baja fish taco which is a Dos Equis beer battered cod filet with Roma tomato, mixed cheeses, shaved red cabbage and yogurt sauce in a flour tortilla. The cod filet was massive and, that, plus the ingredients might have warranted a large tortilla to hold everything. The yogurt sauce was zesty adding to the taste of the whole taco plus it gave the taco a little more depth and kept it from tasting dry. I wasn’t blown away by this taco but I was impressed at the quality of the cod and how well it was fried. The black beans were a little bland and I might go with the Mexican rice next time. I was impressed with the quality of the whole meal plus the service was fantastic. We had about 18 people at three different tables and we all got our food pretty close to one another. I look forward to giving the Live.Eat.Surf. crews’ other restaurants a try the next time that I visit my friend, Adam, who lives a short bike ride from Tower 7. If you are down in Wilmington, check out K38 Baja Grill at either of their locations. 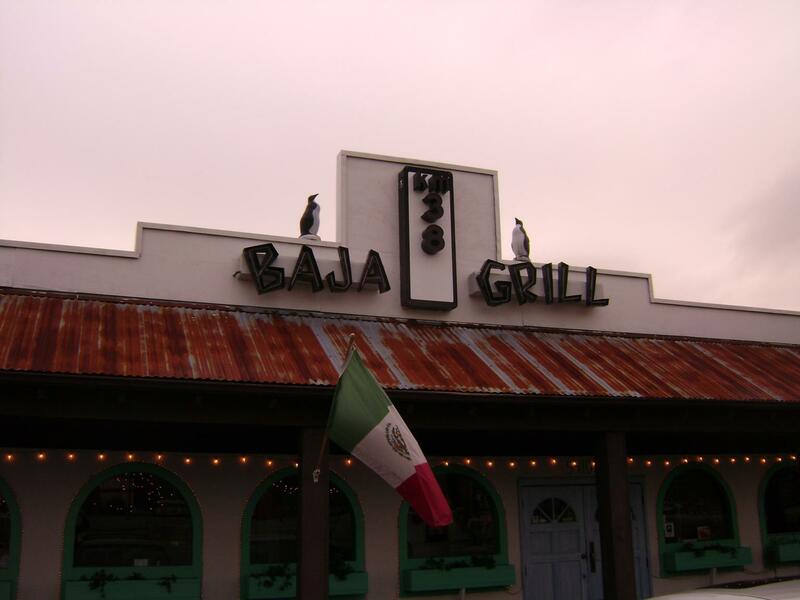 I don’t think you will be disappointed and everything that I hear says that it is the best Tex-Mex or baja place in town. Every time that I go to Wilmington, I tend to order seafood items off of menus because I’m at the beach. It could be the salty air or the freshness factor but I am always in the mood to order shrimp, fish or crab. However, it is nice to take a break from the ocean’s bounty when down in Wilmington and I took one a few weeks ago when I ate at Sweet N Savory Cafe, one of Wilmington’s busiest breakfast and lunch spots, off of Eastwood Rd. Sweet N Savory might not be the greatest name for a restaurant ever but it has been able to thrive in Wilmington from delicious food, great service and a friendly atmosphere. 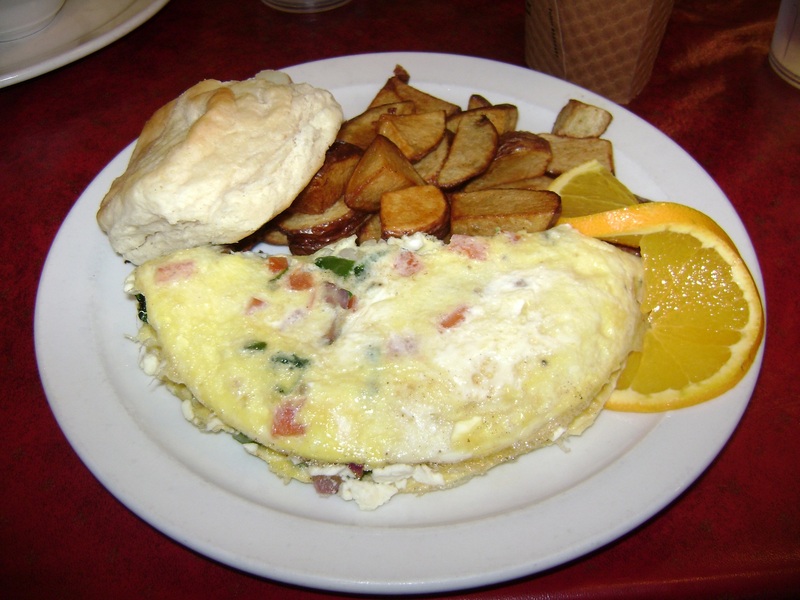 They serve a wide range of breakfast items like omelets, eggs, breakfast sandwiches and tons of bakery items that they make fresh daily. The lunch menu at Sweet N Savory is enormous which is great but always makes it hard for me to figure out what I want. 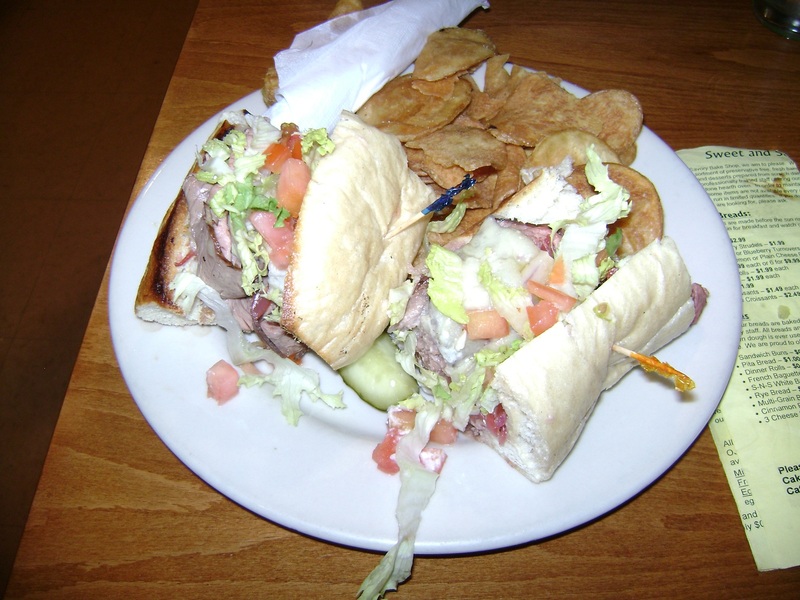 They offer everything from soups to salads to sandwiches with a huge variety of each. I decided to go with the Black Rabbit Pub Sub (From the Black Rabbit Pub in Arundel, England. Slow roasted roast beef, melted Swiss, onion marmalade, lettuce and tomato on a traditional heath baked French baguette) which was one of their seasonal selections. The roast beef was extremely tender and rare. The onion marmalade was very interesting and gave the sandwich a sweetness that is uncharacteristic of roast beef sandwiches which tend to be slathered in horseradish. The baguette was both crunchy and soft showcasing the skill of the bakery at Sweet N Savory. 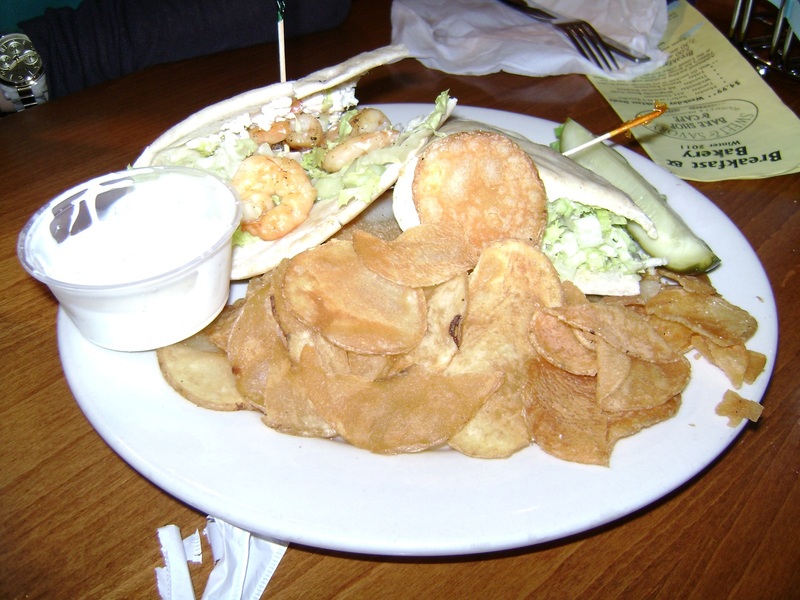 Jordan ordered the Shrimp Gyros (large shrimp, feta cheese, cucumbers, lettuce, tomato, onions and cucumber dill sauce on a toasted pita). It wasn’t a traditional gyro which normally dons a massive amount of tzatziki but the feta cheese and cucumber dill sauce on this gyro gave it enough flavor without making it overly soggy. The shrimp were large & fresh (possibly local but I didn’t inquire) which I was glad to see because there are many places that tend to skimp on the quality of the shrimp. Jordan said that it was great although the pita wasn’t as fluffy as she was used to. 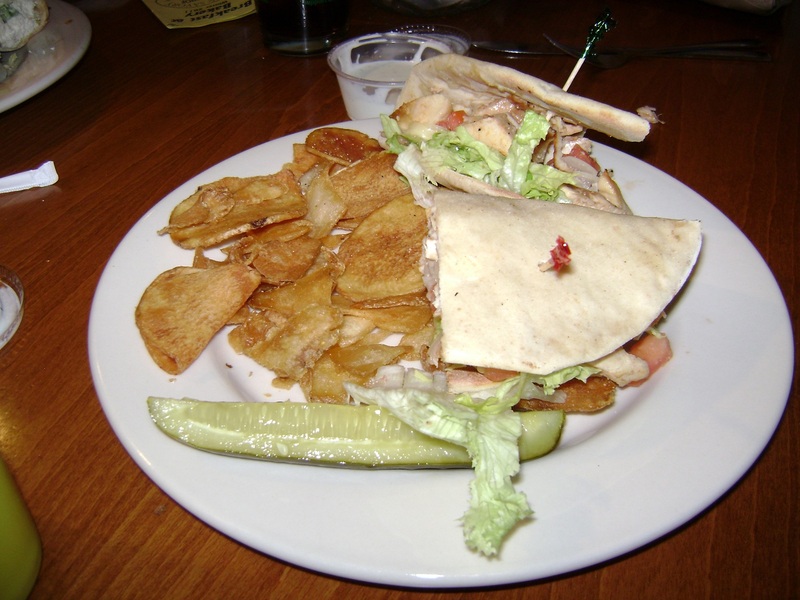 Ashley went with the Chicken Club Pita (marinated chicken strips, Swiss, Parmesan, bacon, lettuce, tomato, onion and mayo on a toasted pita) which she said was pretty refreshing. It seemed like Sweet N Savory’s pita has the same issue of not being as fluffy as most of us are used to but it may be a little bit healthier. 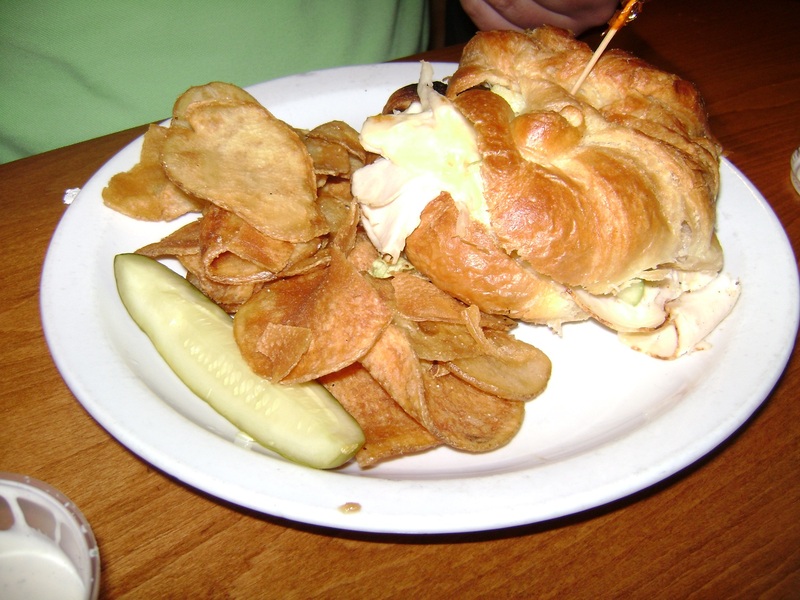 Elliot ordered the Johnny Appleseed (Premium turkey breast, Havarti cheese, Granny Smith apples and honey mustard on our homemade croissant). The waitress said that it was a customer favorite and Elliot said it didn’t disappoint. He said tartness of the Havarti and the sweetness of the apple and honey mustard were a good contrast that equaled out the richness of the croissant. Sweet N Savory is a local favorite so you will most likely find yourself waiting shortly in line for a table but its worth the wait. Definitely a great Sunday meal before you hit the road after a weekend at the beach. Check it out and let us know what you think. 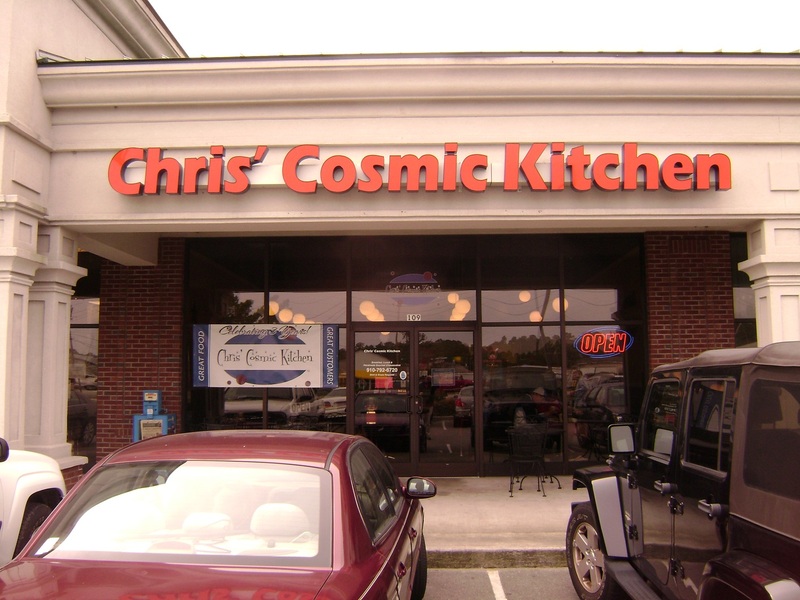 I came across Chris’ Cosmic Kitchen (CCK) from a recommendation by my friend, Adam, who lives down in Wilmington. He is a regular at Chris’ Cosmic Kitchen and introduced @EatItNC and @CosmicKitchen via Twitter. Chris’ Cosmic Kitchen is a family-owned restaurant in Wilmington run by Chris & Kristen Lubben. Chris is a ’95 graduate of the Culinary Institute of America and has been cooking at various upscale restaurants in North Carolina (except for a two year stint in Florida) since then and opened up Chris’ Cosmic Kitchen three years ago. He is always a force to be reckoned with in the Wilmington Top Chef competition. I went up to Chris’ Cosmic Kitchen with my friends, Adam and Casey, for a some late breakfast (served all day) and early lunch after a fun night out at the beach bars on Wrightsville Beach. The restaurant is located in a strip mall on Eastwood Drive right off of Market Street about 2 miles away from UNC-Wilmington. 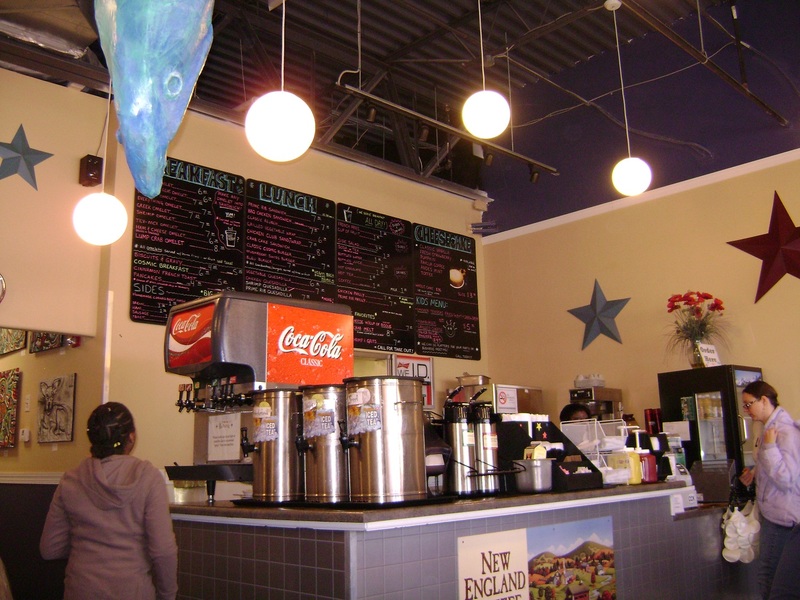 The interior of the restaurant has a cosmic theme with stars all over the walls and planets (a cartoon moon and globe lights) hanging from the ceiling. The atmosphere is great and all the employees had smiling faces and were very welcoming which contributed a great deal to the experience. Adam got the COSMIC Breakfast which is two eggs (any way) with a choice of country ham, sausage patty or bacon, toast or biscuit, and home fries, fruit or grits. I didn’t try any of Adam’s COSMIC Breakfast but it looked like a great breakfast. 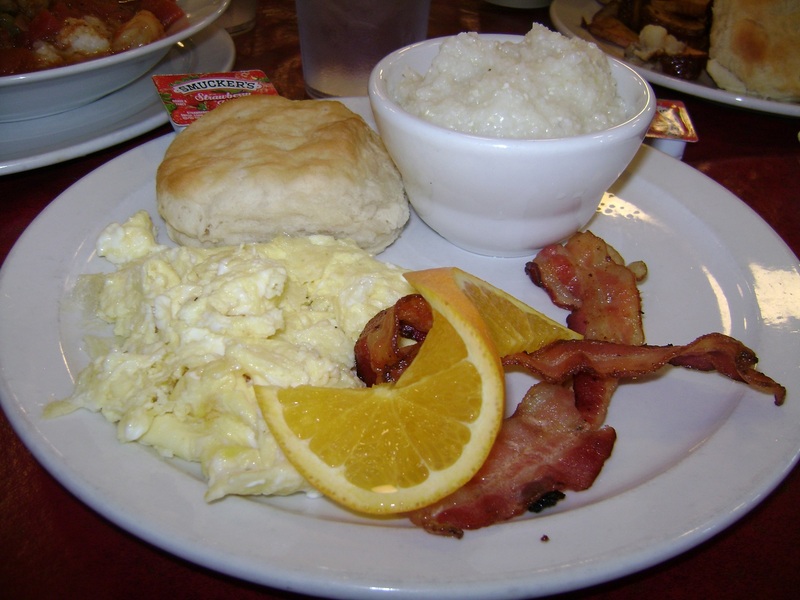 The eggs looked light and fluffy and the grits were thick and looked to have a nice peppery kick to them. It must have been awesome because Adam didn’t leave anything on his plate expect for the rind of the orange twist. I got the Farmer’s Omelet which was on special that day. It came with a side of home fries and a biscuit as well. I don’t tend to go vegetarian but an omelet with onions, peppers, mushrooms, spinach and feta cheese just sounded awesome…and I was right. Chris stuffed the omelet full of all of the ingredients (take notice to the feta crumbles falling all out above) and cooked it to a fluffy thickness. The home fries were good but didn’t really blow me away. Ketchup helped. The biscuit was great. I halved it and spread jelly on it but I kind of wish that I had gotten an order of biscuits and gravy because someone next to us had it and it looked fantastic. Casey decided to get away from the late breakfast mentality that Adam and I were in so she ordered the Creole shrimp & grits. 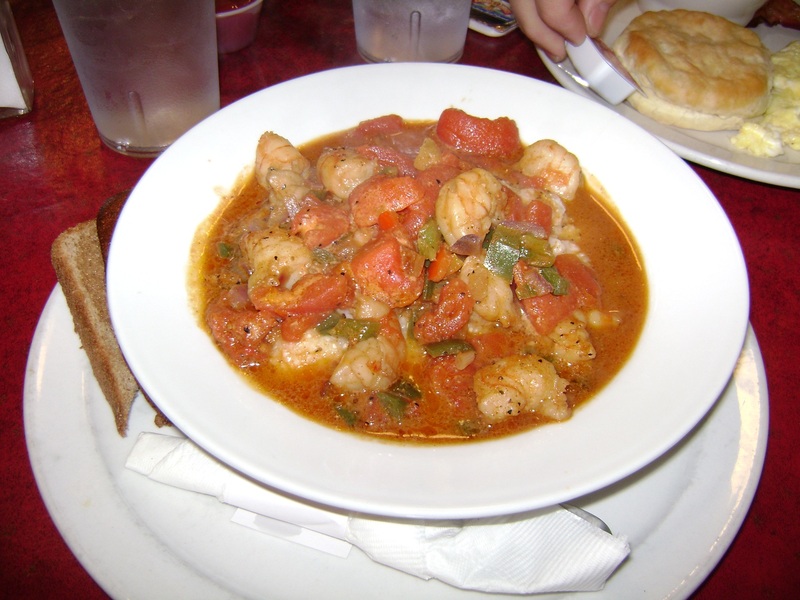 In North Carolina, we are mostly used to the creamy, rich version of the dish from our neighboring state to the south so it was nice to see the NOLA (New Orleans, LA) version on the menu which is a lighter, tomato-based dish. The Creole versions tend to vary in style from a heavy, thick reduction of the broth that is spooned on top of the grits to what is basically a soup poured over the grits. Chris cooks the soup version of the Creole shrimp & grits which I tend to like better because it hasn’t been thickened with cornstarch and it opens up the grits a little bit more taste-wise than the other version. He cooks green peppers, red peppers, stewed tomatoes, red onions and shrimp into a broth which exploding with Creole seasoning that has a kick but not enough to make most people uncomfortable. I am going to have to try CCK’s lunch menu next time I am there (and get a piece of cheesecake for the road) because it looks awesome and their sandwiches all look picture perfect. Chris’ Cosmic Kitchen is closed on Monday but it open Tuesday through Saturday from 8 a.m. until 4 p.m. and they have a Sunday brunch from 9 a.m. until 2 p.m. It was hustling and bustling while Adam, Casey and I were there and Adam told me that they get a lot of traffic from the UNC-Wilmington crowd there. If you are in the area, you should definitely stop in and grab a bite to eat. Don’t let the exterior of the restaurant fool you, this place is the real deal.